Adapted from a news release by Carolyn Shapiro and Basil Waugh, Communications Officer, Gund Institute for Ecological Economics, basil.waugh@uvm.edu. Let’s say a farmer wants to plant wildflowers to nurture the bees that pollinate her crops. Currently, she would have to walk through her fields, assess locations, take measurements, spend hours crunching costs, and still only guess at the amount of pollination the effort will generate. Soon, the farmer can do it all on her phone or computer with an app that will calculate the crop productivity and pollination benefits of supporting endangered bees. 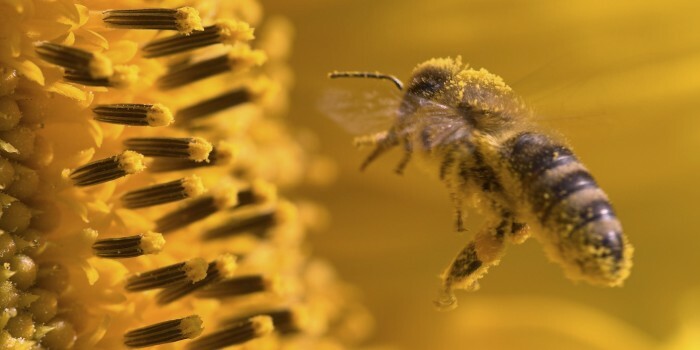 University of Vermont (UVM) bee expert Taylor Ricketts, who is co-leading the app’s development with Eric Lonsdorf of the University of Minnesota (UMN), introduced the technology on February 19 during the American Association for the Advancement of Science (AAAS) annual meeting. Ricketts was on the panel Plan Bee: Pollinators, Food Production and U.S. Policy. The app, which goes live later this year, is a product of the Integrated Crop Pollination Project, supported by the USDA NIFA’s Specialty Crop Research Initiative. The researchers are developing the app with Philadelphia software company Azavea. A soon-to-be named beta version will allow users to explore land management scenarios and virtually test how bee-friendly decisions would improve their business, says Ricketts, who is director of UVM’s Gund Institute for Ecological Economics and Gund professor at UVM’s Rubenstein School of Environment and Natural Resources. Co-lead (and Gund affiliate) Lonsdorf is a lead scientist with the Natural Capital Project, a partnership of UMN’s Institute on the Environment, Stanford University, the Nature Conservancy, and the World Wildlife Fund. His expertise is in the development of ecological models to inform decision-makers. He approaches conservation management challenges as if they were business problems. The app builds on the first national map of U.S. wild bees, which found the insects are disappearing in the country’s most important farmlands — including California’s Central Valley, the Midwest’s corn belt and the Mississippi River valley. That study showed that with further bee losses, farmers could face higher costs and the nation’s food production could experience “destabilization” due to climate change, pesticides, habitat loss and disease. “We found 139 counties — which together contain 39 percent of pollinator-dependent U.S. crops — at risk from simultaneously falling wild bee supply and rising crop pollination demand,” says Ricketts, who published the map with UVM’s Insu Koh and others in the Proceedings of the National Academy of Sciences (PNAS) in December 2015. Ricketts notes that more than two-thirds of key crops either benefit from or require pollinators, including coffee, cacao, and many fruits and vegetables. With the app, the researchers hope to make the best available science and bee-friendly practices accessible to society — to make real steps to reverse bee losses. Apps are really becoming a new trend when it comes to solving everydays problem with an easy fix. It is great to see how technology and innovation are used to bring new and smart fixes to our problems.